1. 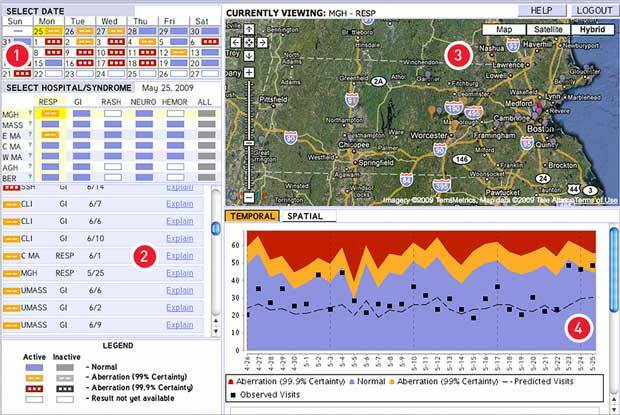 The Select Date window shows emergency room activity across 20 participating hospitals spanning late May and June 2009. The purple bars indicate that ER volume was within normal range, based on historical data, whereas the orange and red bars signal higher volume. 2. State officials can click on the highlighted dates to identify the hospitals showing higher-than-expected ER volumes and recurring symptoms as categorized by “syndrome.” On May 25, Massachusetts General Hospital saw an unusual volume of patients with respiratory ailments. 3. AEGIS summarizes the potential outbreaks detected at each hospital during the previous three weeks. The red dot indicates a hospital that has reported many potential outbreaks, whereas purple dots indicate hospitals with few or no potential outbreaks. Officials can click on each dot for more details. 4. This graph shows the daily number of ER visits for the MGH from late April through May 2009 with black boxes; the dashed line denotes predicted visits. The volume of visits is showing spikes against historic norms, veering into the orange alert zone. Using natural language processing and other advanced search tools, bioinformatics experts are mining patient file—and striking paydirt.